HEY attempts to relay affection remotely using a bracelet and some haptic feedback. The project is currently within touching distance of its Kickstarter goal with three weeks to go. If you’re in a long distance relationship and all you’re doing is sending each other gifts, you’re missing out. UPS is not at the cutting edge of innovation in that field. Those who are at the cutting edge have been busy helping people hear loved ones’ heartbeat through a pillow, feel each other’s heartbeat in a ring, and even message kisses using an iPhone dock with fake lips. 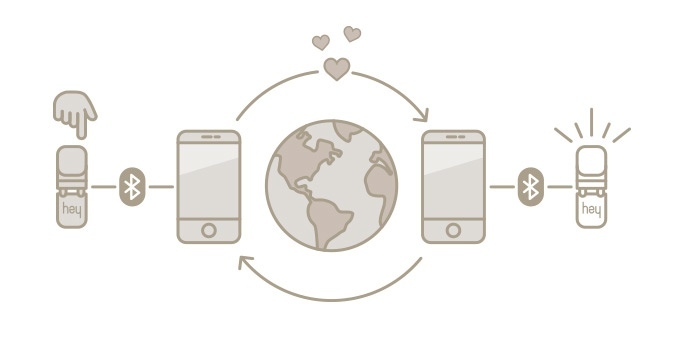 Once you’re done detecting your partner’s palpitations and making out with your phone, you can fall back on a simpler form of affection: touch, as facilitated over long distances by the HEY bracelet. Based on the premise that “A touch is worth a 1000 [sic] words,” HEY attempts to relay affection remotely using a bracelet and some haptic feedback. The short version of how it works is that you squeeze the bracelet, and a loved one wearing the bracelet feels it through their own bracelet. It’s hard to say how much more effective that might be than a thoughtful text or a raunchy Snapchat pic, but an extra option is always nice. To go into the functional details a little more, HEY works tandem with a smartphone app. Both bracelet and app are paired over Bluetooth. To initiate communication, you touch the bracelet at two different points (so as to avoid accidentally triggering the device). When the app detects a touch on your end, it notifies the app on your partner’s phone. That leads to the bracelet softly tightening around their wrist, which the makers claim mimics human touch. HEY is within touching distance of its $132,000 Kickstarter goal, with the help of over a thousand backers. The campaign has raised $107,000 so far with about three weeks until it comes to a close. Early bird units are being made available at $80, which is 40 percent off the expected retail price of $125. Each package includes two bracelets that come in individual boxes, along with two chargers and instruction manuals. Unfortunately, there doesn’t seem to be a way to ship each bracelet to a different location, which would have been a nice option for those already living apart. 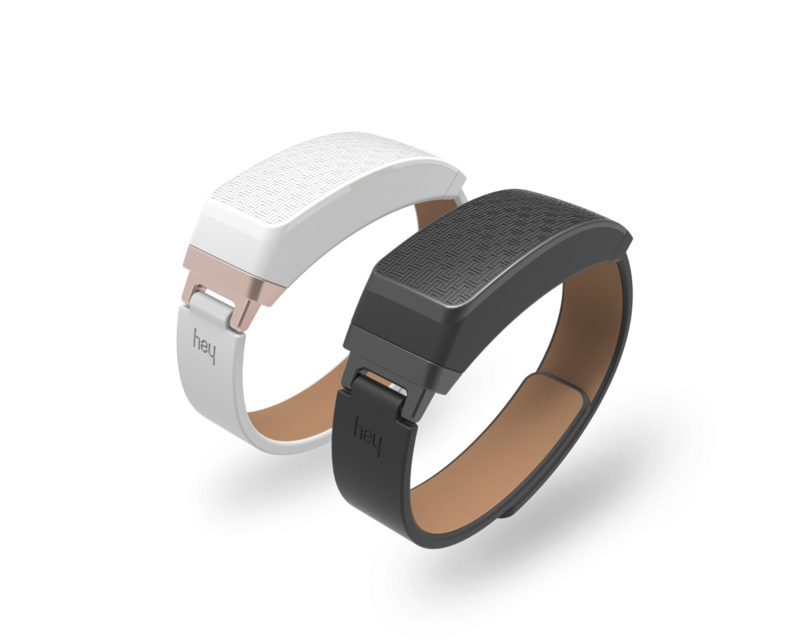 “We want to make sure that we reach our target and get those bracelet shipped to our backers as soon as possible,” van der Goot says of the company’s immediate goals. Following that, retail channels will be explored. “Based upon the results of the Kickstarter campaign, we will automatically open up an online shop and will start contacting retailers.” Additional product features could also be in the pipeline, based on feedback from the early user community. This might be the cure for long term relationships 🙂 I would love to “feel” what my partner is sending over this way. Very affordable and practical when you think about it. I hope the campaign goes well. I think that the fact that you get 2 in the same package is a nice feature 🙂 Putting this up against the other two products that you listed, I think this is the least creepy. Having three weeks left is not that much time, but talking about the product here should help. Good luck to the company, I might consider backing them. They are very close. I like the tech here, but I am not sure its a long standing product. I read about the lips and the ring that pulses and thought, this is just the sample of the small group of products like this, right.? Look at that, I was right. I am guessing we are going to see even more until it seems like you are with your significant other 100% of the day without seeing them. I actually bought the ring for a long lost love of mine. It was pretty creepy and I really never heard back from her. I wonder if she is wearing it or she is dead?